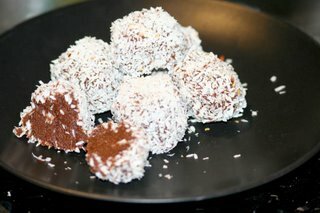 One of my latest raw food obessions is spicy chocolate date balls! They are ohhh so yummy and provide that cravable lucious flavor of cocoa with a smooth creamy filling. These are super easy to make, and super good for you too! I grind about 1/2 cup each of raw pecans and cashews in a food processor and set it aside. Then I blend up about 1 1/2 cups of coarsely chopped dates and about 1/4 cup of water, 2 tbsp of honey, and 2 red jalapeno peppers until the it is all blended well. Then I add about 3/4 cup of cocao powder to the mixture and mix until all is blended. i make this too, but without the jalapeno. it sounds like it gives it a nice kick...have to try it.